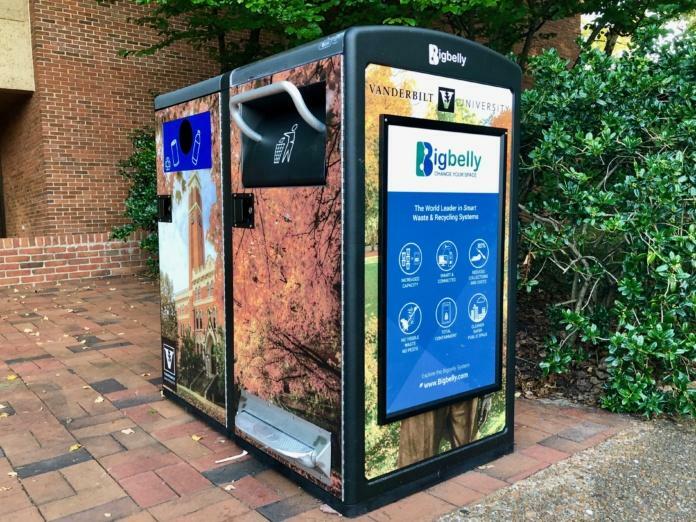 Vanderbilt University is the latest campus community to join the ranks of facilities using Bigbelly to modernize their waste operations on campus. This private research university located in Nashville, Tennessee enrolls over 12,500 undergraduate and graduate students who enjoy a pristine urban campus designated as a national arboretum while being surrounded by Nashville's cityscape. As reported by the myVU Newsroom, "the Division of Administration’s Facilities department has invested in two new sustainable technologies for the 2018-19 academic year. Integrating sustainable practices throughout campus is a fundamental element of FutureVU. Bigbelly solar-powered compacting trash cans and recycling bin units were installed around Rand Hall and one at the new [bus] shelter. The units increase the amount of trash that can fit into one bin so fewer trash cans are needed. The bins also use solar energy to report fullness status to Plant Operations, saving labor hours of emptying bins that may not be full. 'Taking a look at improving our current operations on campus while making a meaningful difference to reduce waste and energy is important,' said Mark Petty, assistant vice chancellor of plant operations. 'Using sustainable technologies that are simple solutions to everyday problems is a win-win for facilities, the university, and ultimately the environment.'" Vanderbilt Plant Operations has been talking with Bigbelly for a few years, and the implementation of the cans came together for this year with the introduction of the lease program. Initially, the company only allowed purchases, but Buckley said that the lease program made more financial sense. 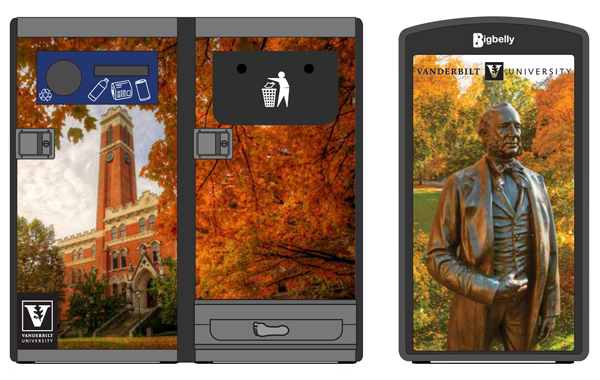 The current machines are under a five year contract in which Vanderbilt pays monthly fees. The bins are also a step-up from a typical waste bin. They have twice the capacity, as well as have a foot pedal to provide users hands-free use. Further, the bins have customized wrappings and message panels."